Tristano di Robilant, Stone Song, 2012. 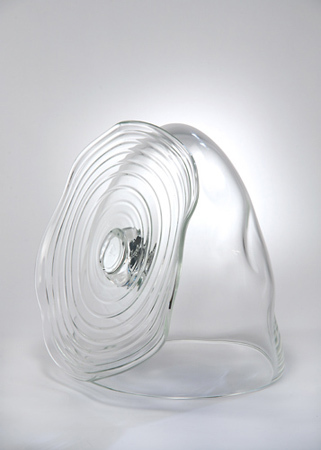 Blown glass, 42 x 39 cm. Faggionato Fine Arts is pleased to announce White River, the second London exhibition of works by Italian American artist Tristano di Robilant. The exhibition will present 8 new glass sculptures and a large ceramic wall piece. In these works di Robilant continues his investigation into the nature of glass and its paradoxical state: a substance that is both a liquid and a solid. His process of enquiry is rooted in the establishment of an archetype, an almost Platonic ideal that is transformed through the necessary communication between artist and master glassmaker, designer and executor. The forms resulting from this process, which embraces the element of chance, allude to the grandeur and complexity of architecture both natural and man-made. This is perfectly conveyed in Tree of Knowledge (part three), 2012. Through these works the artist continues to explore his fascination with the surface of his material, the translucency of the glass and the interplay of light and reflection add to the sense of movement and weightlessness. For the artist, these sculptures often represent oblique meditations on emotions encountered while reading texts by writers as diverse as Ezra Pound and Gottfreid Benn. Di Robilant has come to emphasise this delicate relationship between the idea and the work by reducing some the chromatic qualities prevalent in his previous sculptures. The work Sunset Grand Couturier is an example of these principles. A satisfyingly smooth ring at the top exaggerates the passive strength of gravity and appears to capture the moment in time when a water droplet might split from a splash before forming the iconic shape of a crowned coronet. White River is the inaugural presentation of di Robilant’s foray into large-scale ceramic works. This expansion of practice is congruent with his interest in traditional Italian industry, of an artisan kind. Composed of 30 blue panels, measuring a total of 4 metres square, they are reminiscent of the blue of a bright summer’s night where words and white line drawings adorn the surface. It appears as a constellation that revisits the designs of past work and captions them with two columns of poetic insight. The title of the show, White River, refers to the white clay found on the banks of the river Tiber that runs into Rome past the artist’s home and studio in the rural town of Ripabianca. Born in 1964, Tristano di Robilant lives and works in Rome and London. He has exhibited widely in Europe and America. His work is in both private and public collections in Europe and the USA. Collections include Albright-Knox Art Gallery in Buffalo, Museo del Vetro in Murano and the U.S. Department of State, in particular the U.S Embassy in Rome and Mumbai. A comprehensive overview of the works of Tristano di Robilant was published by the magazine DOMUS in September 2010.